We wish to inform everyone that this site is hosted for our family and close friends. We have not submitted to any search engines or advertised in any way. If you have reached this site looking for something else, we apologize for taking your time. However, please feel free to browse our site. 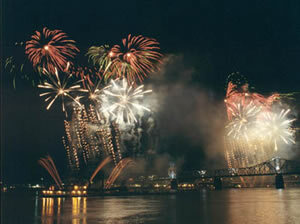 Thunder Over Louisville takes place every year in mid-April. It marks the start of the Kentucky Derby Festival. It is the largest fireworks display in the country. The bridge across the Ohio river between Louisville and Clarksville is lined with launchers as well as eight barges out in the middle of the river. Standing on the banks of the river, you can actually feel the explosions. It is quite a sight to see and feel.